Should You Adopt a Deaf Dog? Photo Credit: West Jersey Volunteers for Animals in Woodbury, NJ. 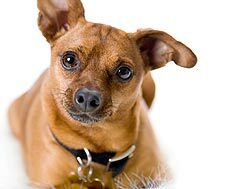 Deafness in animals can be congenital (inherited from birth) or acquired through trauma, drug reactions, or old age. Deafness is more common in white animals, though any animal can be deaf. Some breeds, such as Dalmatians and Boxers, are more prone to deafness than others. Thirty percent of all Dalmatians born are either unilaterally deaf (deaf in one ear) or bilaterally deaf (deaf in both ears). Some deaf animals also have albinism, meaning that they lack normal melanin pigment in their eyes, nose, or skin, though not every albino animal is deaf. Deafness is also sometimes accompanied by other medical issues such as blindness or low vision. Deaf pets are just as intelligent as hearing pets. They are great for those who only want one pet or for those with other animals in the home – it’s a myth that a deaf pet “needs” a hearing companion to function successfully. In fact, Petfinder’s staffer Trevor is the proud caretaker of Keller, a blind and deaf Great Dane. Deaf animals bark, meow, whinny, and make all the regular sounds their hearing counterparts make. They can be taught sign language commands and are fully trainable. 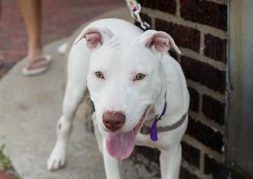 The only real caveat in adopting a deaf pet is that they should never be allowed to roam freely outdoors unless they are in a securely fenced enclosure, since they cannot hear cars or other dangers approaching. The mission of the Deaf Dog Education Action Fund (DDEAF) is to provide education and funding for the purpose of improving and/or saving the lives of deaf dogs. They are working to find homes for adoptable deaf dogs, and to increase awareness of the noble and loving nature of deaf dogs. For more information on living with or training a deaf dog, visit www.deafdogs.org. Is a Deaf Dog Right for Me? Find out what to expect when adopting a deaf dog and whether a deaf dog might be right for your family.